There are worse metaphors for my month than the Big T’s chainsaw. There have been days when I’ve effortlessly cut through “the big stuff”, and others when it’s felt like my plans and good intentions have been chopped off at the knees. But overall, we managed to tackle some jobs that have been over-long in the “too hard” basket, and reward ourselves with a few escapes from our normal landscape. I’ve already posted shots from most of these trips, (very poor planning) so here are a some from a long-delayed visit to The Lighthouse (see below), an exploration of the walk and cycleway under Mangere Bridge (we weren’t even sure it existed), a visit to the beautiful Northland beach at Whananaki where T and I once camped, and a few days in Rotorua. A highlight of that trip was the Redwoods Tree Walk; 28 connected suspension bridges, up to 20 metres off the ground in the midst of the redwood forest. I hate heights — but it was fabulous. It is open until 11pm, and the forest is lit up at night, but there were massive queues the evening we considered it, while we had the daytime walk almost to ourselves. It hasn’t felt like a particularly creative month. I messed around with a design for a tote to hold a couple of bottles of wine, on the basis that this (suitably filled) would make a good gift. The design is good, but I’m struggling with execution. In the kitchen, my sourdough obsession has produced a few attempts at pizza / pizza bread. I’m definitely getting there, and T is happy for me to keep experimenting!! The Lighthouse is a work of public art by NZ sculptor Michael Parakowhai. It’s sited at the very end of Queen’s Wharf in the CBD and from the outside, is a 1:1 scale replica of a New Zealand “state house” of the 1950s. The interior is completely open and contains clustered neon lights and a large scale statue of Captain Cook (there is an identical sculpture in the New South Wales Art Gallery). It’s an interesting work — with the interior defying expectations. I didn’t manage to capture any particularly good interior shots, but there is one in this article. And uou can read more about it here. 2) on the tree walk, I ooo’d and ahhh’d over every photo … and then I got to the last one where you’ve shot up looking at the top. omg – I’ve seen a lot of tree photos shot somewhat like this, but the angle on this one has produced a stunning photo. From these photos, I’d say you were greatly inspired this month!! Hope you get to indulge your pizza craving Joanne — perfect for cold nights. Funny, I rarely think to use video on my camera and when I do, I never get the shot I was looking for. That’s sensible – hopefully with a little caution you’ll be able to keep adventuring for longer!! Some great shots here. Your pizza looks yum. Downtown Auckland has changed somewhat since mt time there. It’s great to see these photos. Glad to give you a nostalgia hit. Auckland seems ever-changing these days, and not for the better. Money will always fond a way to take control. You look like you’ve had a very busy month, Su. It must have been nice to have a break. That tote and pizza look wonderful. Perfect for picnicking. It has been lovely to have some down-time with the Big T not away or at work. I’m happy with the tote design (and I loved that fabric), but my sewing machine is struggling to cope with all the layers of material, so I may have to rethink it a bit. I bet. Hold on to those nice vibes for a bit longer. Su. Just when you think you think you’ve nailed it, there is always another challenge. It’s been nice having T home and on holiday from work for a couple of weeks. Sad face. I really enjoy reading your posts Tracy; Changing Seasons included obviously. No rush Pauline. I always enjoy seeing your garden, whenever you post. Definitely think the Redwoods Walk is fantastic, and you can buy a ticket for both a daytime and nighttime visit for not much more than a single visit. I’d be interested to know what you think of the Lighthouse if you do visit. My NZ daughter is visiting at the moment so not much blogging time till next week…. I’m glad you continued with this. The changing climate isn’t just information anymore. Now it’s an international challenge to see if we can do what we need to do to save our planet. We need to do more, I think than merely showing pretty pictures. We need to TALK about the way the climate is changing and how it is affecting wildlife and our lives. It seems you don’t have to travel far to find some interesting places around you. I recall a treetop walk somewhere down in the south west corner of Australia which was pretty good although the OH wasn’t happy – he is even worse with heights now. The ‘Lighthouse’ looks more like a ‘Light’ House I shall have to read the link you gave to see what that is all about. Glad you are continuing to host this challenge Su. I’m going to use it to record the changes in a little garden walk near home this year to get a finger on what flowers when! I love your idea for your Changing Seasons posts Jude. It’s great how we’re all using the basic challenge differently. T and I have made a conscious effort to find the little, out of the way parks and beaches that abound in Auckland — partly because we both get so grumpy in crowds, but mostly because we’re nosey and feel like we should be more aware of the city we’ve both spend most of our lives in. I dislike crowds too which is why I avoid the Cornish beaches during the summer holidays. There are a few accessible ones (a lot aren’t to me now as I can’t/won’t scramble down cliffs) that I want to visit in the ‘off-seasons’ though I am beginning to think they no longer exist. Thank you. The tree walk was very cool. I really liked that the platforms between bridges had seats and lots of information boards, so you could stop, enjoy the view and learn about the forest. The kids we saw seemed to really engage with that. Thanks Tish. The tree walk felt very safe for the height-averse like me. I probably wouldn’t want to be on the bridges with many others at the same time — the longer ones especially. Getting back to the ground was weird at first — like getting off a boat. Hope the coughing subsides soon and doesn’t spread. Great to see that the challenge is still continuing! My blog rhythm got disturbed when they moved the “Weekly photo Challenges” and when they later discontinued it, I just fell off completely. Now I only blog ebery now and then. The music and other stuff takes up so much time. Anyway: great gallery and it’s so green and lush around your parts of the world. Sometimes bread and butter is just the perfect food. Your life is surrounded by so much beauty: the landscape, art, food, projects … even in a month where you say hasn’t been particularly creative! I am envious! and so happy to be able to share vicariously through your photographs & posts. Thank for your lovely comment Ju-Lyn. I do feel increasingly lucky to live here, and have the opportunities to enjoy and participate in so much. I have reached a stage where I see life in terms of how I can give back, and nurture the environment around me. Something we should all emulate and do more of Su. We only have this one world we live in and we are not doing a very good job as tenants to take care of it! The photo with the chainsaw has made my morning. Here in a world that looks and feels like a deep freezer, it’s wonderful to remember that warmer days are coming when we can get outside and do the chores. Also the pizzas look scrumptious. Oh dear, now I’m hungry. We have lots of old trees on our property and sometimes they need a bit of ‘help’ so that they don’t topple down on someone’s head. Hence, a chainsaw. Very useful pieces of kit — but they scare the hell out of me. Sue your post makes me home sick for my second home. Besides my nostalgia and sentimentality your posts are full of interest to me. 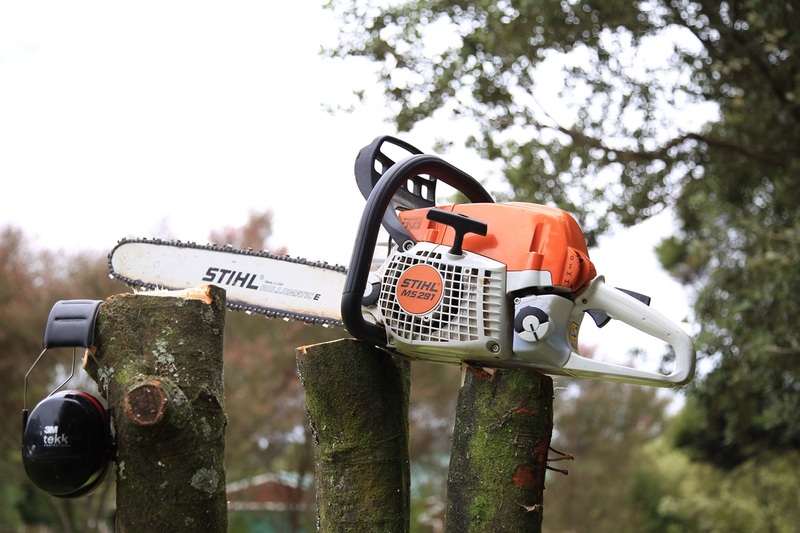 Stihl a good photo, perhaps that is why it is the number one selling chain saw in the world. Also the pizza looks tantalizingly delicious better than an add for Pizza Hut. Thanks so much Jack. Hope you and Pauline have a wonderful time here with your whanau.